It was announced this week that the Clark County School District Police Department had settled a lawsuit in a case in Las Vegas in which a teen killed a 25 year old woman while driving drunk in 2009. That teen, Kevin Miranda, had spent the evening drinking heavily with CCSD police officers at a holiday party hosted by school police dispatcher Rebecca Wamsley. Dozens of other teens were also present and allowed to drink during the party, as well. None of the numerous cops present even so much as stopped Miranda or, presumably, any of the other teens (or adults) at the party from driving while drunk. As soon as the police heard about the accident, they “sprang into action,” initiating a cover up to ensure nobody within the school police department investigated the conduct of those at the party. They also stonewalled an investigation by the Las Vegas Metropolitan Police by making the ridiculous claim that they all were “looking at the wall” during the time that all of the teens were drinking. In reality, officers were actually playing beer pong and doing shots of hard liquor with the teens. Amazingly enough, Federal Judge Larry Hicks actually ruled that the officers involved in the cover up were protected from a federal lawsuit because they were “acting within the scope of their duties” at the time. Therefore the parents of the victim, Angela Peterson, were limited in state court to a $75,000 settlement, which they refused to accept. The settlement was accepted on their behalf by Mark Cook, the lawyer representing them, and placed into a scholarship fund in Angela’s name. Not surprisingly, part of that agreement is that none of the officers who engaged in the cover up will be charged or in any other way punished for their actions. Meanwhile, Captain Jim Ketsaa, the man former Chief Phil Arroyo says he assigned to carry out the “investigation” has now been promoted to replace him as the chief of the CCSD Police Department. In addition, Erik Aldays, who was formerly the head of the school police union, has stated that many officers that new about the incident were afraid to come forward and provide information because they thought they would be punished if they did. 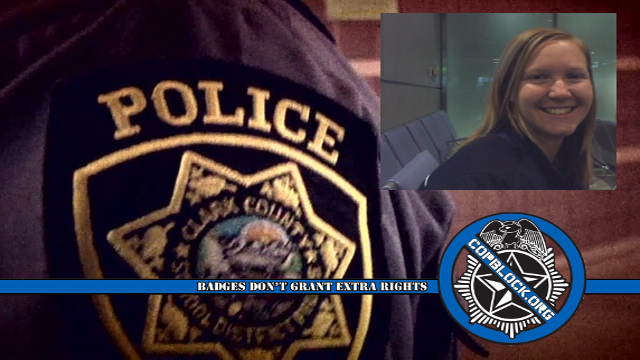 Frank and Linda Peterson are continuing with individual lawsuits against three officers who were not given legal immunity, Officers Mark Robbins, Tina Zuniga, and Cynthia Ruelas, all of whom attended the party and were actively involved with Miranda while he was drinking. Robbins, in particular, is accused of playing beer pong with teens, including Miranda, during the party.